Either you don't believe in the merits of branding as I do and find it overrated or you try to take it serious. - the desktop as such is not the goal anymore, we are beyond that. The obvious problem is a smissing solution-oriented view. That is branding gibberish, too, and meant, our customers, users etc don't care for technology, they care for solutions. Google Chrome OS has a user conception, the operating system is a browser, towards which it steps forward and for which it makes use of KDE technology but they could as well take Gecko. Even if it is unfinished the plan is clear. KDE4 has no user concept, it is more: here is plasma and fantastic things would be built with it, we call it the Plasma desktop. So as there is no user conception KDE4 retroconverges against KDE3. As an example think of a city in Europe. You can totally destroy a city by warfare and citizens will naturally rebuild the city because what matters is their own vicus in mind. KDE3 is the vicus of KDE users. I appreciate the value of giving the community a nameable, and more clarified identity to remove the ambiguity, but this seems to be suffering from trying to say too much at once. Why not just KDE Desktop, KDE Netbook and KDE Software? Part of making a name 'catch' is ensuring it (or an abbreviation) rolls off the tongue. It feels very wordy to refer to what has previously been just 'KDE' with 'KDE Software Compilation' (multi-syllable word's ftw!)... and the abbreviation... KDE! If I understand, the reason this is thought to not be a problem is that this name will not be actively marketed to the public - but if that is the case, what is the purpose of rebranding? I guess in short my feelings are: "nice idea, but keep it snappy?" Nice work on looking into this however, it's good to see branding being taken seriously. Firstly, KDE Desktop is problematic for historical reasons - it has been used already a lot in a poorly defined way and if you want to shorten KDE Desktop, well you're going to call it KDE - you can't shorten it to Desktop because that's far too generic : "I use Desktop"
About "KDE software" - that has to be a catch all term for any software KDE produces - otherwise you're saying something is not KDE software because it's not released in the Software Compilation? Re the Mac analogy: KDE Plasma Desktop is like saying Apple Mac OSX (well, not really, Mac and Plasma have different meanings) but both can be shortened in simiarl ways: Mac OSX, Plasma Desktop. Why not KDE Kwin Desktop? It could have been. It could have been KDE Crystal Desktop (our codename when we were working on the structure before choosing names). We brainstormed names but there were a few considerations, one is that we felt Plasma sounds quite good and was marketable, another is that the term "Plasma Netbook" has already gained a bit of traction and recognition without us even trying to push it - a sign that it could be successful and it's one less thing for us to fight (this thing you've been calling Plasma Netbook - yep, that name is cool with us). We didn't aim particularly to grab a name of one of the workspace technologies for the brand. Re purpose of the rebranding: to promote things like Plasma Desktop, Plasma Netbook and the individual KDE Applications (and the Platform too). We will be pushing those. The software compilation not so much - we discussed calling it KDE Foo 4.4 where Foo is something snappy, but then people would probably latch on to that, not talk about Plasma Desktop, Plasma Netbook and the individual KDE Applications so much and we'd jsut have replaced KDE 4.3 with a new brand KDE Foo 4.4 and still be apparently marketing everything as one homogenous unit, just with a new name. That really would have been a pointless exercise. Yours are all valid questions - hopefully I've answered them. Thanks again for all the hard work, it is appreciated! How is the set of software supposed to be called which is started when you log in in KDM? And what should we say if someone asks us what DE we use? It is not just Plasma but it is not the whole whole software compilation either which contains many utilities which whe might not use. Software started when you log in: Plasma Desktop (or Plasma Netbook) I would say - sure, you probably have some other apps that start up too, but the workspace is the defining thing that you're actually logging in to. Same answer for which DE you're using. As you note, it's not just Plasma (by which you mean the Plasma framework?) but the combination of that, KWin and a whole load of other things that I'm not technically enlightned enough to even know about. And yes, I doubt there's anyone out there who uses everything in the Software Compilation. "I'm logged in the (KDE) Plasma Desktop, made by KDE (a group of people making these cool things)"
I actually quite like this: "Plasma Desktop" springs more imagination, and things to talk about (like about how everything blends and is fluent) then when you'd just called it "KDE". The story quickly ends there. My thoughts on the new branding. It took me a while, but I think I get it now. So, the name of the project/community will be KDE and the main name that will be marketed for the desktop environment will be Plasma. 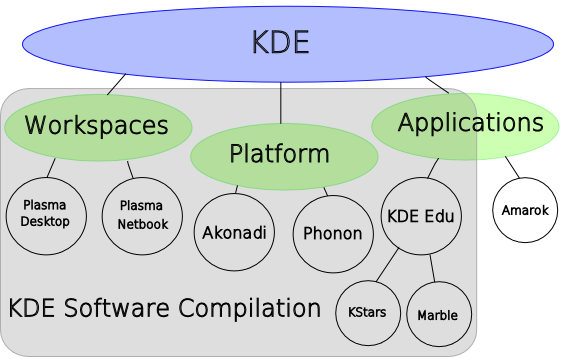 KDE will be the equivalent of Microsoft and Plasma will be the equivalent of Windows, except that Windows is a series of Operating Systems and Plasma is a series of 'Workspaces' (which means desktop environments). This means that the 'GNOME vs. KDE' debate will now become the 'GNOME vs KDE Plasma' debate. A conversation could be: "Which desktop environment do you use? GNOME or Plasma?" Well, I have a few comments. "Sometimes we use the term "KDE project" as a weak way to say "KDE community". We have grown far beyond the situation where you could refer to KDE as a “project”. It is not a limited effort to solve the problem of having a desktop GUI for Linux anymore. It has evolved into a thriving community of people continuously working on creating and improving free software for end users based on specific values, ideals and goals." I don't see any problem with the word project. It does not automatically mean small and limited in scope. I consider the word community to be worse. To me it sounds like a user group or a group of fans, not the group of people who create the software product. So I would suggest to keep the word 'project'. Let KDE be short for 'the KDE project' or 'the KDE community project'. The same thing is used by 'the Fedora project' and 'the openSUSE project'. They are both community projects that produce software. Second, I think it will not be easy to make people forget about the 'Desktop Environment' meaning in KDE. It is a well known term among the general IT public, and often abbreviated to DE. There are also products like LXDE and CDE. However, as I pointed out earlier, it is worth the effort, so let's try it. It will be hard work, but not impossible. Third, it can be a bit confusing to have Plasma as the main brand name for Workspaces and at the same time have Plasma as the name for one of the technologies which make up the KDE Platform. Maybe the technology could be renamed to Plasma Core, or something similar? Fourth, the word Desktop is very confusing. It can mean many things. -Desktop can be used to refer to a certain type of hardware. There are also: server, laptop, notebook, netbook, nettop, smartphone, mobile phone, gaming device etc. Desktop in software has other meanings. -It can refer to the base page you get in the graphical environment of your operating system. -Desktop can also be used as shorthand for Desktop Environment, which includes most of the graphical facilities around the base page I mentioned earlier. See also http://en.wikipedia.org/wiki/Desktop_metaphor for the second and third meaning. For this reason I consider the name 'Plasma Desktop' very confusing. Since there is also a 'Plasma Netbook' it seems that Desktop is referring to hardware here. But the article seems to suggest it is used in the software meaning. I don't like it. It is interesting to see how Opera Software ASA names its products. They call their browser for desktops 'Opera'. Their browser for the Nintendo Wii is called 'Opera for Wii'. For mobile phones they have two products: 'Opera Mini' and 'Opera Mobile'. KDE Plasma for the main desktop environment, instead of KDE Plasma Desktop. KDE Plasma Mini for the version for netbooks and other small screen devices, instead of KDE Plasma Netbook. Okay, that was it. My first comment on KDEnews. A bit longer than I expected. Good luck with the new branding! "I don't see any problem with the word project. It does not automatically mean small and limited in scope. I consider the word community to be worse. To me it sounds like a user group or a group of fans, not the group of people who create the software product." If you're not comfortable with the term "community" for the people who create KDE software, I think that "KDE team" should also be fine. "KDE is no longer software created by people, but people who create software." Isn't that basically the same thing, but just worded differently? Oh, there is a real difference. Take for example Adobe Photoshop. Photoshop is software created by people. Adobe is people who create software. They're not the same case. They're not the same case. Adobe is an official entity which can decide to develop an application. But the KDE developer community is _defined_ as the people who develop the (official and unofficial) KDE software. Or is there any other definition for the new usage of the term KDE? Of course the KDE community and the Adobe company are not exactly the same. The point is that both produce software. You can read "KDE Plasma" or "KDE Dolphin" the same way you read "Adobe Photoshop". I was not trying to claim that Adobe is an open source developer community. They are the same case. "Adobe is an official entity which can decide to develop an application. But the KDE developer community is _defined_ as the people who develop the (official and unofficial) KDE software." The only real difference between Adobe and KDE, in this regard, is that Adobe has restrictions on who can enter their team. KDE hasn't. I like the changes a lot! I don't know if I'll tell people "I use KDE SC 4.4" instead of "Look, this is KDE 4.4". But When it becomes unclear what I'm talking about, I can now fallback to "KDE Software Compilation 4.4" and know that the dot says the same. I assume I'll still say "I am a KDE user, and this is my KDE Desktop" (show screenshot). But I just realized that there's a change already: Before reading your article, I'd have said "This is my KDE". And maybe I'll eventually get used to telling people "This is my KDE Plasma Desktop". Wow. Straight into the Abyss. I was thinking that KDE was moving towards end-user, not tech specialist. And now I get this: "KDE Software Compilation". Do KDE marketers really care about the simplicity of KDE branding? "KDE is no longer software created by people, but people who create software." Great metamorphosis. KDE has always been (at least in people's minds) a desktop environment, not a group of programmers. In fact people don't care about them or the community. What I want to say in the nutshell: such rebranding is really going to create a mixup and strengthen people complexes about Linux unfriendliness towards them. footer of this site mentions 'K Desktop Environment': """KDE, "K Desktop Environment", "KDE Dot News", "got the dot?" and the KDE Logo are trademarks or registered trademarks of ..."""
I'm writing this from the perspective of a very small company that sells computers with Kubuntu ready-installed and ready-to-use (www.tuxfarm.de). I come from a completely different background (journalist, author, translator, etc.) and took up Linux as a hobby. For that reason most people I around me know nothing at all about computers, except where to click to start Word, OpenOffice or Firefox. I absolutely support the repositioning of the "brand(s)". I was always meaning to read the new book by Jono Bacon, the Ubuntu Community Manager. My experience is that "The Community" (whatever it really is) is the most vital component of any internet-based (software) project today. In practical terms, I would even go a step further. I would identify what is unique about certain programmes and push this unique characteristic with all there is. "Hey, how do I burn a CD on Linux?" "Well just click on the icon with the CD and the flames. The application's called K3b. Then click on the icon saying 'New data project'. The rest is drag&drop and automatic". "Hey, do I need Nero for Linux? It's not that expensive." "No, use K3b. It's the icon with the CD and the flames. It's easy to use, just drag&drop. It's even better than Nero, because..." (don't know, I've never used Nero). Quite a few people use Linux around me (thanks mainly to my efforts :-) ) All they will ever know about KDE is that there's Amarok for MP3s, K3b for the CDs/DVDs and, perhaps, KMail for e-mails. Yes, and that's mainly because of brands, community (me telling them; and many people using the applications) and usability. Practically everyone I know uses Firefox. They don't know what Mozilla is and they don't know what Open Source really is all about. They just know: "internet, that's Firefox." In that vein I would advocate going even further. A word like "KPresenter" simply doesn't really stick (all these "K-Words" are awful to pronounce in German). KOffice is not much better. I think animal names are generally quite good. Even better, to my mind, is if you can see what the special characteristics of an application are. As far as I understand (although I haven't tested it a lot), KWord is much better at boxy-typed layout that we know from Scribus or Adobe InDesign. So how about KDE Box Office, or BoxOffice or something like that? I don't think there really is a point having two nearly identical applications in the world of Free Software. So if KWord is different from OpenOffice Writer, how about really pushing this vital difference? That brings me to "boxing matches" (e.g. Gnome vs. KDE): I think that's nonsense. I use GParted for formatting USB sticks, I use Gimp for pictures, I use Firefox a lot, because so many editing windows in content management systems don't work 100% with Konqueror, although I really like Konqueror for simple sites. I don't think there will be "all-out winners". There will be mainstream applications of 2-3 "flavours" and niche applications. Just pick and mix. I think people should be proud to be working on software that some, or even many, people want to use, that really works well and that practically anyone is able to use. For the rest, time will tell.